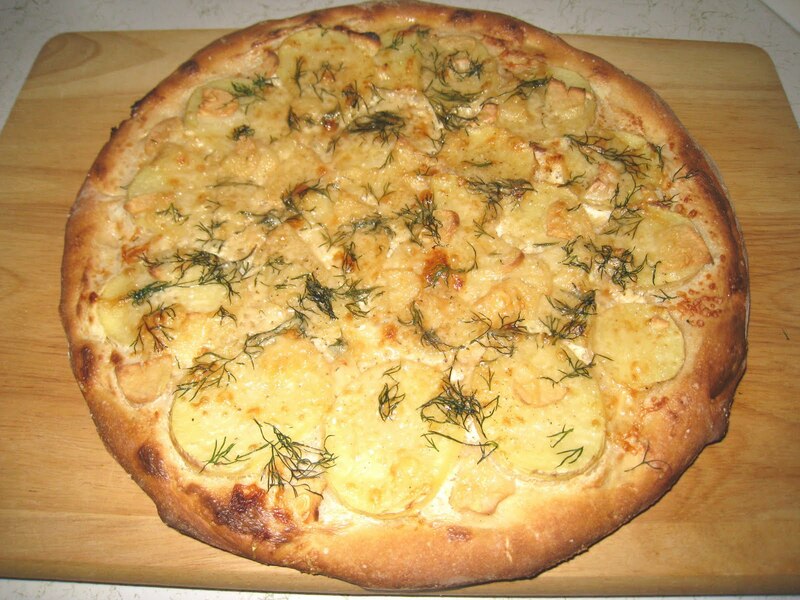 A few weeks ago I decided to try my hand at a potato pizza. It was not terribly successful, but it had enough possibility for me to try again. Armed with the experience of what had not worked before, I was more successful the next time. I did not use any sauce on the first try. Instead, I used a generous amount of extra virgin olive oil. I did not want to use a tomato sauce or a white sauce, and I thought (hoped) that the olive oil would be enough to make the pizza moist and succulent. Alas, it was not. Also a few weeks ago, I bought a container of sour cream for some vague purpose about which I completely forget. And there it sat, alone and unoccupied, patiently waiting for me to notice that it was ready and available to be put to use. And ticking, every now and then, with the impending expiration date. My pizza dough makes two pizzas. This last time I only had enough tomato sauce and mozzarella for one. What to do with that second round of dough? Was there anything I could do with the sour cream? I have been craving potato salad the past few weeks - maybe I could do something with potatoes and the sour cream. I also had some huge purple-skinned heads of garlic I found at Whole Foods, and of which I had bought copious amounts. A good Swiss Gruyere and fresh dill would round it out perfectly. And it did. I stretched out the dough and smoothed a thin layer of sour cream over it, then I seasoned it with salt and pepper. I sliced a Yukon gold potato as thin as I could without a mandoline (wish list for sure) and spread them over the sour cream in an even layer. I was going to overlap them a little for the visual effect, but I was worried they might not cook if I did that. I think I was right, so if you are going to try this I would not overlap the potato slices. I sliced the garlic and sprinkled those over the potatoes, and then some finely-grated Gruyere, and then finally I sprinkled fresh dill over the whole thing. I cooked it in my usual 450 deg. F. oven for about 18 minutes. Right off the bat it looked it much better than my first attempt at a potato pizza. 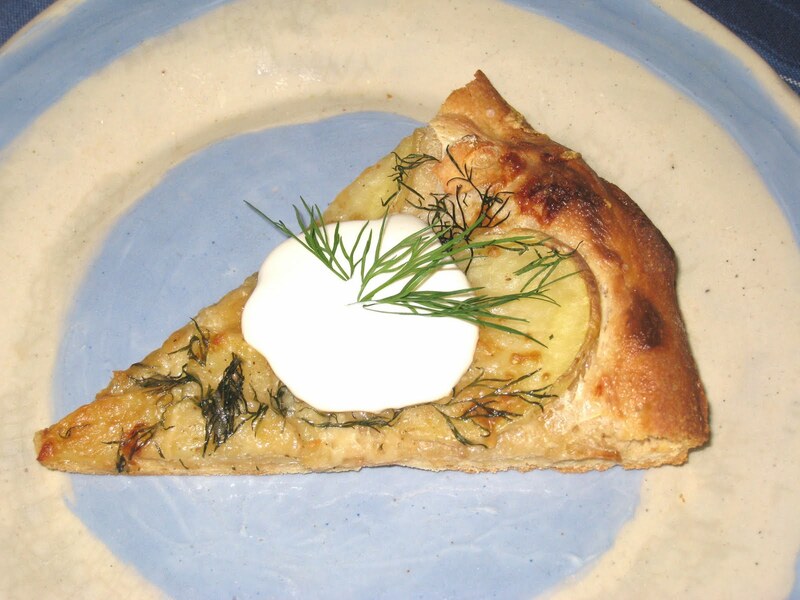 It was still a little dry, though, so I put a dollop of sour cream on each slice and spread it out before I ate it. That did the trick, but I still need to find a way to make the pizza itself more moist. I don't know why I am shying away from a white sauce, but for whatever reason, I just don't want to use one. I was a little leery of using too much sauce because I like my crust to be crispy, but I think I could maybe have used a little more. Next time I think I will spread another layer of sour cream over the potatoes before I add the cheese, garlic and dill. Yes, I think that will do it. 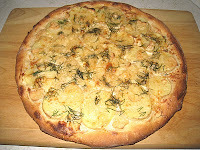 In the meantime, however, I will be thoroughly enjoying this potato garlic pizza. And thinking about what other pizza varieties might be worth a try.